At the end of last issue the REAL threat to Earth 2 was revealed to be…none other than that world’s Superman, now under the control of Darkseid! But, if you think the revelations stop here…think again. Tom Taylor ably picks up where James Robinson left off with the Wonders of Earth 2! It’s not hard to guess that the new, inexperienced Wonders stand little chance against the might of Superman, and a retreat is definitely in order. So, what can stop this threat? Sam Lane is finally ready to release a project very near and dear to him. Just what that is…and who is behind it…is in the preview pages published elsewhere by DC, but frankly it is far too big a spoiler to include here. While this project is readied and Doctor Fate gives his best shot against Superman, Batman has plans of his own. Will any of these ideas work against Earth 2’s original Man of Steel? You’ll have to check out the issue for more. Fans of Jay Garrick get very little of Earth 2’s Flash here, but we do see in his brief scenes more of his everyman qualities that make him a very good character in this ensemble. His “someone needs to do this, so it may as well be me” attitude leads him into danger, but also demonstrates his heroism. Now for the answer to the big question…yes, Tom Taylor was an excellent choice to take on this title. Taylor picked up where James Robinson left off and hasn’t missed a beat. My only complaint is that, as a Flash fan, I’m always looking for more Jay Garrick in the story…but then again, I could give that same quibble with most of the other issues of this otherwise excellent series. Even though I’m a big fan of Robinson’s work on this title, I have to say that I’m impressed with this issue. Something that has not changed is the excellence of the artwork by Nicola Scott on pencils, with inks by Trevor Scott and colors by Pete Pantazis. Overall, this is a great start to Taylor’s run on Earth 2. This entry was posted in Reviews and tagged Earth 2, Earth 2 #17, Nicola Scott, Tom Taylor on November 6, 2013 by Ed Garrett. Superman being my second fave DC comic book character (and the first one I knew)….really, really, REALLY tired of Evil!Superman in any world dimension. Ditto on Batmen. So…has a Green Lantern…oh wait, that’s right…..Alan. What happened to Alan in this book? Or Hawkgirl? Every preview/review I’ve seen doesn’t feature them of late. PIcked it up last night and gave it a read. The last Earth 2 I read was the annual and issue 7 I think, but it wasn’t too hard to follow. I’m very intrigued as to who the new Batman is and if you want evil Superman, Taylor is your guy. I really enjoyed his writing on Injustice, I only hope we can see this Superman saved and redeemed. I gave up on this title after the first story arc. I LOVE the concept and I think the general story direction is great, but the basic writing and dialogue was just so poor in my opinion. Maybe if I hear good things with Taylor in the writer’s chair, I’ll go back and pick up some back issues. 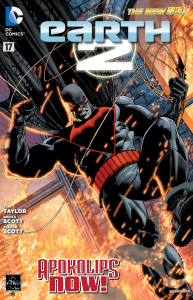 I really like Earth 2, and I really like Tom Taylor’s writing on the Injustice comic so I decided to not drop Earth 2 once Robinson left. It was a good decision. Issue #17 was great, and it picked up right where #16 left off rather seamlessly I thought.